Mega Multiethnic Supper of Solidarity to Support Friday Umweni's voluntary return to her homeland. Friday UMWENI is a Nigerian citizen present in Italy for more than 10 years with serious social problems. The recent clinical evaluations of his alarming state of health have revealed evident psychic problems due to the problematic of his adaptation to the Italian context as well as his inability to return to his country of origin. 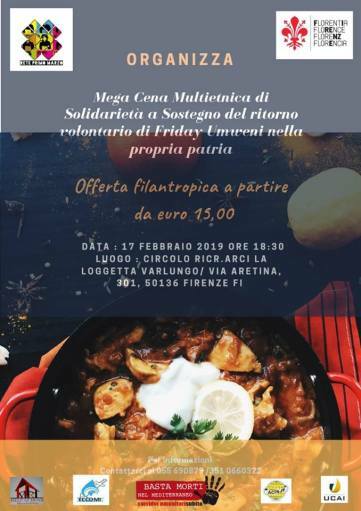 After vain formal attempts to voluntary repatriation assisted with the IOM, the Primo Marzo Network considers this initiative, hoping also in your membership and participation as the only chance for Friday to realize this profound desire.